Do you wanna build a language? And speaking it out loud! Just try and you'll succeed! Good day everyone! After the successful launch of the Gruun language, I have received a number of messages asking how I came up with such a concept and how others whom are interested in doing the same, might go about it. I’m not writing this blog to go through any sort of “correct” way on how to create a constructed language (I personally believe there are multiple ways so my way might not be the same for you), so this blog is merely to demonstrate how I formed one and few of the steps that I’m doing to constructing the next one. With that being said, let’s jump into how I’m creating the first part of the newest language-- Etryan. Unlike Gruun, where the language is comparatively simple, I took Etryan on with a different mindset. I had to put myself in their place, asking myself, “If I were an elf, how would my language sound? What would it be like?” If you know anything about elves, complexity and beauty is apart of their culture. They strive for something quite elegant which is what I kept in mind. Now this is called a phonemic orthography, which is an orthography (system for writing a language) in which the graphemes (written symbols) correspond to the phonemes of the language. I highly recommend that if you want to start a language that you start here with an orthography. I’ve known individuals who like to start at the syntax and vocabulary but for starters, I recommend at least charting out the phonemes that you would like to use. 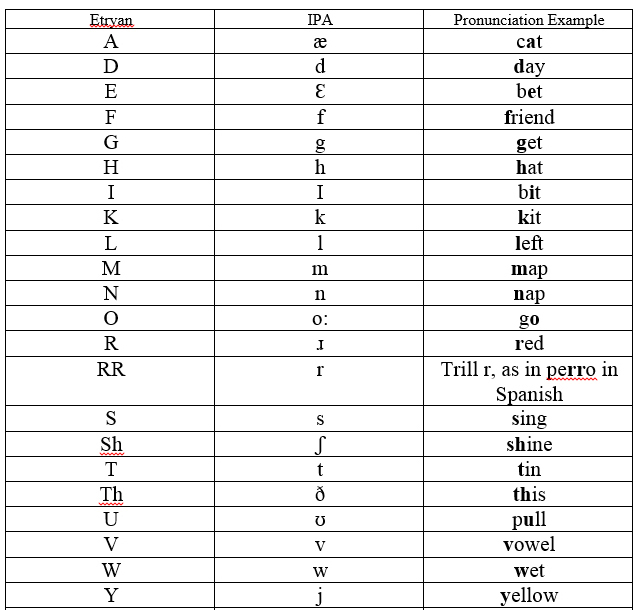 Do note that if you want to get a good grasp of this, you’ll need to learn the International Phonetic Alphabet or IPA. Now I can go on and on in more depth about IPA and the differences between phones, phonemes, and allophones and all the goodness but for the sake of this small blog, I’ll just keep it simple. I highly recommend you have fun with this part and like I said before, don’t be afraid to make a mistake! It happens but make sure you reach out to the community (or even myself) for help and guidance. I never went to school for this. It is just a fun hobby that I do but with some time and practice, anyone can write a language like Gruun or even better! Thanks for reading this small blog. I decided to end it here so not to bombard you with information but I’ll work on the next blog and release it as soon as I can. For further reading, I suggest you check out the Language Creation Society (LCS) at http://conlang.org which I'm a member of. They have a good start and a forum willing to help anyone interested in conlangs. And if there is a big enough interest, maybe we can get a conlang section going and discuss different ones. Sparkling So it seems highly plausible, but I'm going to ask anyway... did you also study Quenya and Sindarin? Sparkling I wrote a small PC flashcard ap for Quenya, with a few Sindarin words in it too. My son picked it for his foreign language one year. We had trouble finding an easy-to-use Elvish language curriculum so I created my own. We would like to release some more... moreI wrote a small PC flashcard ap for Quenya, with a few Sindarin words in it too. My son picked it for his foreign language one year. We had trouble finding an easy-to-use Elvish language curriculum so I created my own. We would like to release some more of the lessons we created for it, but I keep running out of time.